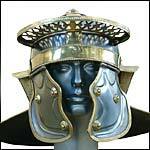 This Functional Italic H Nider Mormter Roman Helmet from brass and steel can be Custom sized to your measurements. Functional Roman Montefortino Helm - Custom Sized to your measurements with optional Liner and Chin Strap. Made from Brass.